St. Charles Place is reminiscent of Louisiana’s French influence, paying homage to neo-French architectural accents to New Orleans historically famous street names. It also brings all of this together is a charming and stately gated community. The garden homes of this neighborhood are well maintained with Creole touches and manicured yards. This is a family oriented community, with walking and bike paths woven throughout the comfortable, curving streets. The entrance is on Norris Ferry road and is very close to the fire station, as well as shopping and dining on Southern Loop. It also is quick hop onto I-49, which provides access to the other interstates and thoroughfares of the city. Southern Trace Country Club just down the road for golfing, swimming, or special events, and St. Charles place is only 10 minutes from an abundance of shopping and dining at the intersection of Youree Drive and 70th Street. Another important issue to families is the school district, and this Southeast Shreveport has one of the best, not to mention there are several state of the art medical centers in the area. 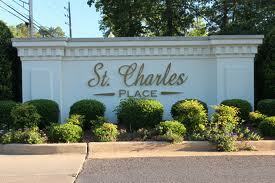 Living in St. Charles place has all of the comfort and style of South Louisiana right here in Shreveport.